Fantasy and reality will blend together to bring action, adventure and comedy to stage Oct. 3-7 at Theatre Northwest. She Kills Monsters by Qui Nguyen follows Agnes, a high school cheerleader, whose younger sister, Tilly, dies in a car accident early on in the play. Although it begins with a tragedy, Agnes embarks on a comedic journey to learn more about her sister after discovering her Dungeons & Dragons notebook, said Josh Blann, play director and NW drama associate professor. The play is set in 1995 and contains references to ‘90s music and pop culture, he said. The story goes back and forth from the real world to dramatized action that takes place during the game world of the characters’ D&D sessions. NW student Jesse Martinez, who plays Agnes, said she has “definitely acquired a lot of bruises” learning the fight choreography. Agnes starts out unfamiliar with D&D but progresses as she learns more about the life and secrets of Tilly, her deceased sister, Martinez said. NW student Lauren Smith fights alongside Agnes as Tillius the Paladin, Tilly’s alter ego inside D&D. Smith said this role is harder physically than other productions she has done before, and fighting convincingly is a challenge. 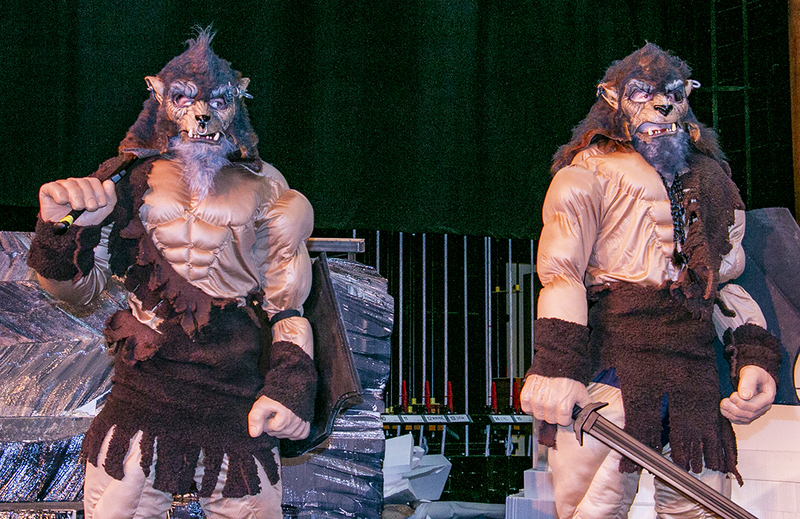 NW students Lane Norris and Tyler Hart are costumed as two of many enemies to appear on stage during She Kills Monsters. Agnes also becomes more and more consumed with the game, which is noticed outside of the game world by her boyfriend, Miles, played by NW student Brian Johnson. Miles exists in the game world in the form of a doppelganger, a character familiar to the D&D universe, Johnson said. “It really caters to actual D&D fans just because it has a lot of in-references,” he said. The monsters are being brought to stage as accurate as possible, said Brittani Evans, monster costume designer, stage manager and NW instructional associate. Evans said she started researching costume design as soon as the play was announced at the end of the spring semester. The play being chosen at the end of last semester also allowed NW instructional associate Allen Dean to get an early start putting together the large set along with George Miller, set designer and NW instructional associate. Larger monsters are constructed as puppets that are functional and can fight with real people on stage, Dean said. Performances will take place at 7:30 p.m. Oct. 3-6 and 2 p.m. Oct. 7 in the theater in WTLO 1108. The play contains some mild language. Tickets are free for TCC students, faculty and staff; $3 for non-TCC students and senior citizens; and $6 for general admission. Contact the box office at 817-515-7724.